Clearly the workers in Westworld have an incredibly long list of problems to deal with already. Between Walter killing people and obsessing over milk, Dolores definitely on the path to true consciousness, other hosts glitching, and hosts going rogue and getting lost — plus the new storylines they seem to be adding in — their schedules must be jammed and full of coffee and/or energy drinks. But, like, while all of these things are totally legit problems to be concerned about and definitely need to be fixed, can we talk about the Man in Black? This may seem like a weird topic, since he wasn’t in this week’s episode, but what DID happen in this week’s episode was two employees hunting down a host who went off his plot line hunting for the stars. They have an uber high-tech Tony Starkish way of tracking hosts (and presumably guests) in the park, and can zoom in on them wherever they are, in case of emergency. So, like, why is nobody noticing the man in black wandering way out into the middle of nowhere in search of this maze? Or at least, why is nobody talking about it? It just seems like such an odd contrast — on one hand, the park is incredibly carefully monitored and even seemingly harmless aberrations like stargazing are treated seriously. On the other hand, THE MAN IN BLACK IS ROVING THROUGH THE WILD WEST TOTALLY WITHOUT ANY SORT OF GUIDANCE OR MANNER OF BEING CONTROLLED, and they’re just cool with it? The obvious answer it that the maze is a real thing that guests ARE intended to find. But then it just seems like there would be a little more guidance from the hosts, like how they lead guests through the other plot lines. I don’t know. We’re clearly lacking ALL THE ANSWERS (which is a bit frustrating a third of the way through the season) but I just kind of want one employee to be like, “oh, look, there’s Tim again. Crazy Tim, out there on his on scalping people and shooting children. Oh, Tim. Total whack job, but on the up side, he looks really chic in all that black.” You know? 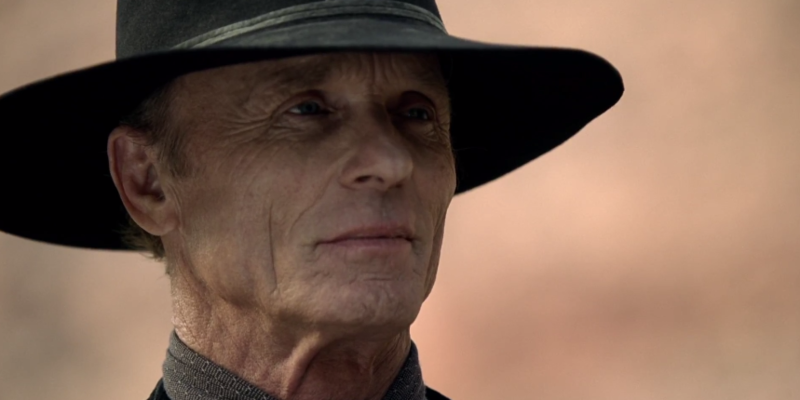 Anyway, hopefully next week we’ll get to see more of the Man in Black, and get a better idea of how he fits into the larger picture, because right now his entire existence sort of seems like an oddly isolated incident that isn’t really impacting anything else. There’s a solid theory that we’re watching this in two different time streams and the man in black is the older version of William, the white hat guest. But hey, here’s another thought — I’m now wondering if the Man in Black has anything to do with Arnold. Eh? What if Anthony Hopkins’ “oh he died” statement was ~metaphorical~, and Arnold IS the man in black. He is the right age, and he does ONLY interact with the hosts, like Anthony Hopkins said Arnold tended to do… sound plausible? Eh? Yeah, no. I have no idea what’s going on, either.